Nissan is investing £22 million in one of the main lines at its UK factory in order to boost production of the popular Qashqai crossover. The company says it still cannot keep pace with the continued growth of the crossover market, despite record volumes of 300,000 Qashqais every year on Line 1 at the company’s Sunderland Plant, round-the-clock production and a build rate of one car every minute. Now Nissan engineers are preparing to improve supply to its European customers by modifying Line 2 in Sunderland to introduce additional Qashqai production, a further investment of £22m in the plant. The first additional vehicles are scheduled for production in before the end of 2016, ahead of the next phase in the Qashqai’s development in 2017 when it becomes the first Nissan in Europe to feature autonomous ‘Piloted Drive’ technology. Colin Lawther, Nissan’s Senior Vice President for Manufacturing, Purchasing and Supply Chain Management in Europe, said: “When the first Qashqai came off the line in 2006 it created the crossover segment. Today it remains the benchmark for European customers for its dynamic styling, exciting driving experience and innovative technology. “Through innovative engineering and productivity improvements, my colleagues in Sunderland have broken production records to keep pace with demand, but our new generation Qashqai has reached a tipping point. Nissan currently manufactures the Qashqai and the electric Leaf on Line 1 in Sunderland, which operates on a three-shift basis. Line 2 production currently includes the Nissan Juke, Nissan Note and Infiniti Q30, and will continue to operate on a two-shift basis. 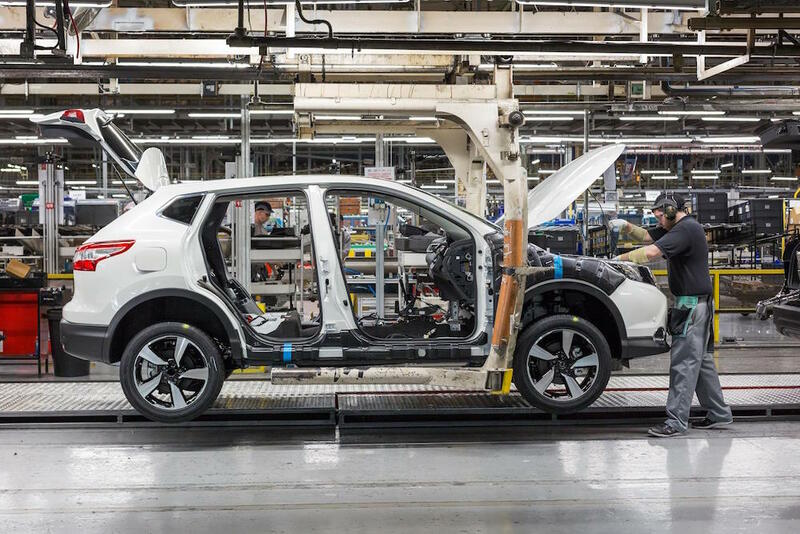 All production areas of Line 2 at Sunderland require modification ahead of the introduction of Qashqai, after which both production lines will be capable of building vehicles based on the Renault-Nissan Alliance Common Module Family CMF-C architecture. Line 2 will additionally have CMF-B capability following the introduction of the next- generation Nissan Juke. Now thirty years old, Nissan’s Sunderland factory is the largest plant in the history of the UK motor industry. The company also maintains design and technical centres in the UK.